Palm Pre 2 Smartphone Coming Soon! Apple’s iPhone pretty much has gotten all the attention in the world of smartphones. Even people who are not exactly convinced of the iPhone’s “greatness” as a mobile phone cannot deny the attention that it has received. Of course, every now and then, we hear of the new phone that can match – or outdo – the iPhone. And, yes, there are “better” phones out there – especially if you take into consideration that different people will always have different perspectives when it comes to technology. So, anyhow, do you remember some time back when Palm announced the Palm Pre and touted it as the iPhone killer? While the Pre got a lot of attention prior to its release, it didn’t really take much away from the iPhone, did it? It’s not over yet, though. 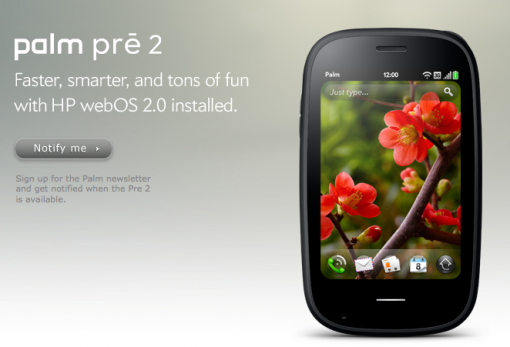 HP has bought Palm and they are launching the Palm Pre 2 very soon! Amazing is just typing to begin virtually any activity. Amazing is multitasking without having to learn new rules. Amazing is hauling in all the information you can handle, and managing it without breaking a sweat. Amazing is making the impossible seem effortless. With HP webOS 2.0, you’ll experience the next generation of amazing. Wireless: Wi-Fi 802.11b/g with WPA, WPA2, WEP, 802.1X authentication; Bluetooth® wireless technology 2.1+ EDR with A2DP stereo Bluetooth support; Wi-Fi router functionality for up to five devices using Palm mobile hotspot. So, is that enough to make you want the Pre 2 instead of the iPhone 4? Meh.